I ask the following of any railway employees reading this. Talking not of generalities, but of this actual incident, after what time should passengers have been allowed off the train? Given what I know about the incident, and how close the train was to the platform at Lewisham, I would suggest a that roughly an hour is the maximum length of time the train should have been stopped before a controlled evacuation was attempted. After approximately 30 minutes it would be wise to start the preparations for an evacuation - i.e. notification to the emergency services and any local staff that may be able to assist (including station staff). Easy to have these rules and/or guidelines though and far more difficult to enforce them rigidly. Even controlled evacuations are not without hazards and takes a long while to complete if you have several hundred people to get off. Stuving makes some sensible suggestions in his earlier post. This event at Lewisham it has also be born in mind the conditions at the time. The whole day it had been a struggle to get and keep trains moving due to iced conrail, to have stopped every train in the area discharge the all the conrail in a much wider area; rules are there must be a whole electrical section discharged on all lines either side of the electrical section effected' this 5 to 10 route miles. By stopping all trains in the area could have lead to a bigger problem. Weather conditions stopping trains once in every 20 or 30 years seems a very reasonable decision. What a contrast to try and keep running through that on South Eastern when the decision in our area to stop running due to weather conditions seems taken at the opposite extreme. Three times last month - for three days, three days and one day - trains suspended on the TransWilts due to the effects of weather. Any reasonable passenger would accept the withdrawal of train services very occasionally in truly extreme weather, perhaps at average intervals of decades. However we now increasingly have a "fair weather only" railway that cant cope with moderately adverse weather. IMO, a good guide is how alternative transport systems cope. In the recent heavy snow for example air and road travel was significantly disrupted, it would therefore be reasonable to expect disruption on railways also. What is not acceptable in my view, is regular serious railway disruption "due to adverse weather" when roads and airlines are operating as normal. An independent report (dated 17th August) into this incident, by Arthur D Little with Southwood Rail Consulting, has appeared on-line here. I've not had time to read most of it yet, but the first definite observation I've found is that the driver of the second train in the procession (2M50) could have been permitted to enter Lewisham P4 under emergency permissive working, which is "intended primarily for the purpose of moving stranded trains into nearby platforms". This was in fact eventually requested, but by then the train had been stopped for an hour and self-evacuations happened first. 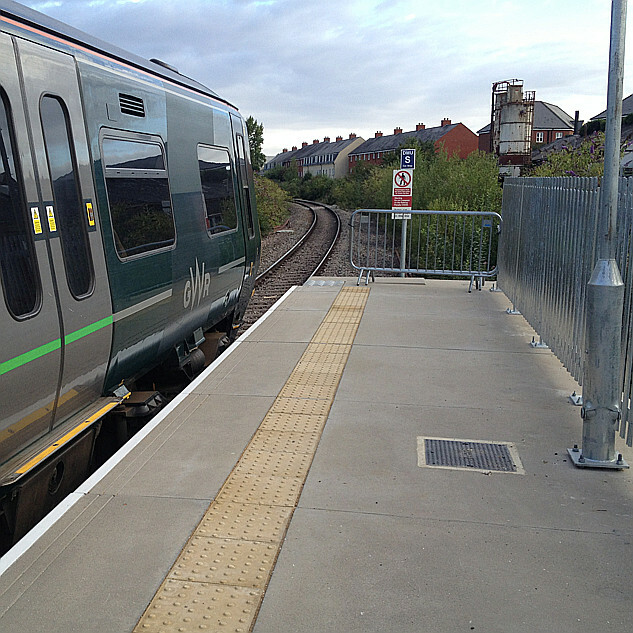 There is a corresponding recommendation to consider how the early use of EPW and intervention to hold trains at platforms can prevent this kind of incident. At about 18:41 hrs on 2 March 2018, a passenger got out of Southeastern train 2M50 and went onto the track near Lewisham station when it was unsafe to do so. Adjacent lines were still open to traffic and the electric third rail traction power system was live. By the time that this had occurred the train had been held at a signal outside the station for over an hour because the train in front, 2M48, was having difficulty drawing power and being able to move forward due to ice accumulation on the conductor rail. Train 2M50 stopped across a key junction and caused the train that was following it, 2S54, to block another junction. This resulted in a further seven trains being unable to move. The electric traction power was turned off in the immediate vicinity within about three minutes of the driver informing the signaller that a passenger was on the track. However, while the electrical control operator was finalising the isolation three passengers also got off train 2S54 and crossed lines that may have been live at the time. Around a further 30 passengers exited train 2M50 of their own accord and went onto the track; a few possibly did this when the lines were still live. Within 45 minutes passengers had got off at least two other trains. The uncontrolled nature of the detrainments delayed traction power reinstatement and resulted in trains being stranded for around four and a half hours. Emergency services attended and helped with incident management and recovery. Although no-one was seriously injured, conditions on all of the stranded trains became very difficult for passengers and staff. Two are directed at Southeastern and concern ensuring that it has a suitably large pool of staff to support train crews during incidents and that the essential needs of train passengers during extreme weather emergencies are reasonably met.